OP3285. 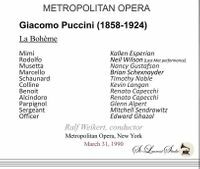 LA BOHEME, Live Performance, 31 March, 1990, w. Ralf Weikert Cond. 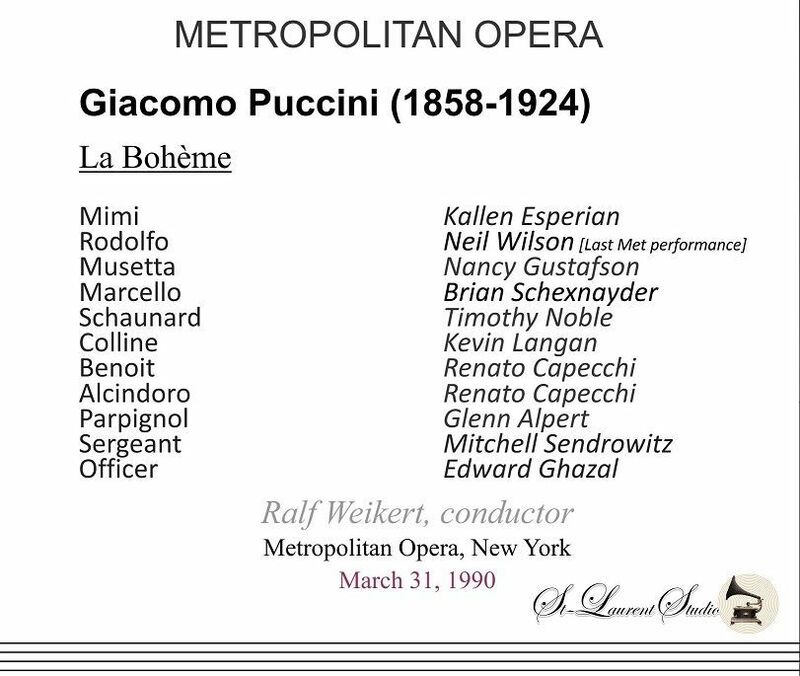 Met Opera Ensemble; Neil Wilson [Wilson's last Met performance], Kallen Esperian, Nancy Gustafson, Brian Schexnayder, Timothy Noble, Kevin Langan, Renato Capecchi & Glenn Alpert, Mitchell Sendrowitz & Edward Ghazal. (Canada) 2-St Laurent Studio stereo YSL T-780. 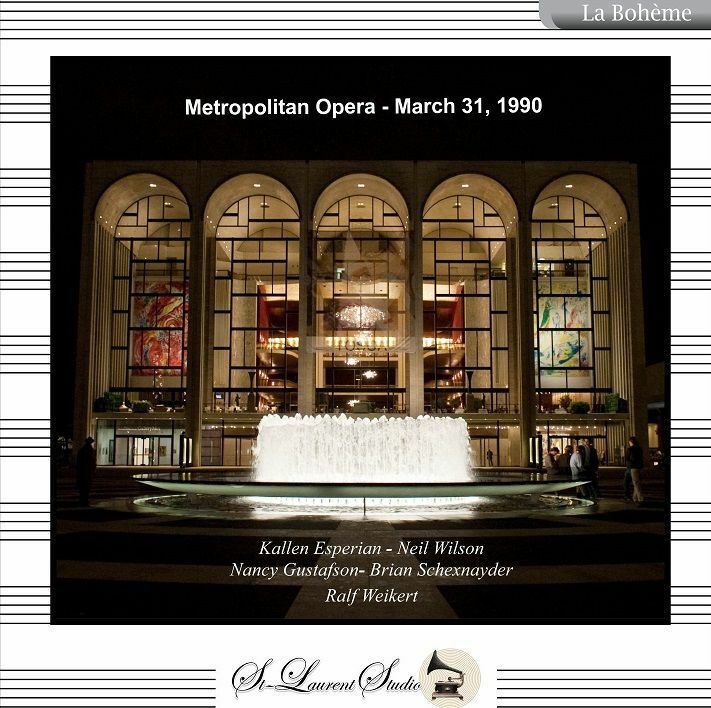 “Kallen Esperian won the Luciano Pavarotti International Voice Competition in 1985. She made her debut in Philadelphia as Mimi in LA BOHEME in 1986....She also sang Cio Cio San in MADAMA BUTTERFLY in 2004, a role she first performed for the Nederlandse Opera in Amsterdam in 2002 as well as for the Metropolitan Opera, New Orleans Opera, Mexico City, etc. Esperian has sung at the Royal Opera House Covent Garden as Desdemona in OTELLO and Amelia in SIMON BOCCANEGRA. She partnered José Carreras in STIFFELIO at the Teatro alla Scala, for their first staging of the opera. She played Desdemona opposite Domingo at the Opéra National de Paris; Mimí at the Teatro Colón in Buenos Aires; Liú in TURANDOT, Desdemona, plus Alice Ford in FALSTAFF for the Lyric Opera of Chicago; Desdemona and Maria Stuarda at the Teatro Comunale di Bologna; Verdi's Requiem at the Teatro di San Carlo in Naples, Falstaff for Los Angeles Opera; Aida and Tosca for the Semperoper in Dresden, etc.